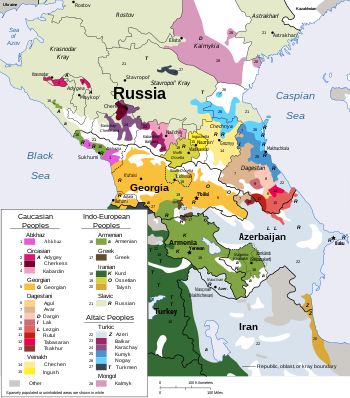 The languages of the Caucasus are languages spoken by more than ten million people in the Caucasus region of Eastern Europe and Western Asia, between the Black Sea and the Caspian Sea. Some of those language families have no known members outside the Caucasus area. The term Caucasian languages can mean only these families or all languages historically spoken in that area. This page was last changed on 5 May 2013, at 11:19.